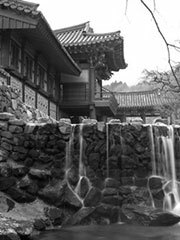 Songgwangsa is one of the most important Seon Buddhist monasteries in Korea, and is considered one of the Three Jewel Temples of Korea. It is located on Jogye Mountain in South Jeolla, South Korea. Founded by Jinul, this monastery is still very active today as a practice center. The practices engaged in at this monastery have been reported on in Robert Buswell’s The Zen Monastic Experience (1992).